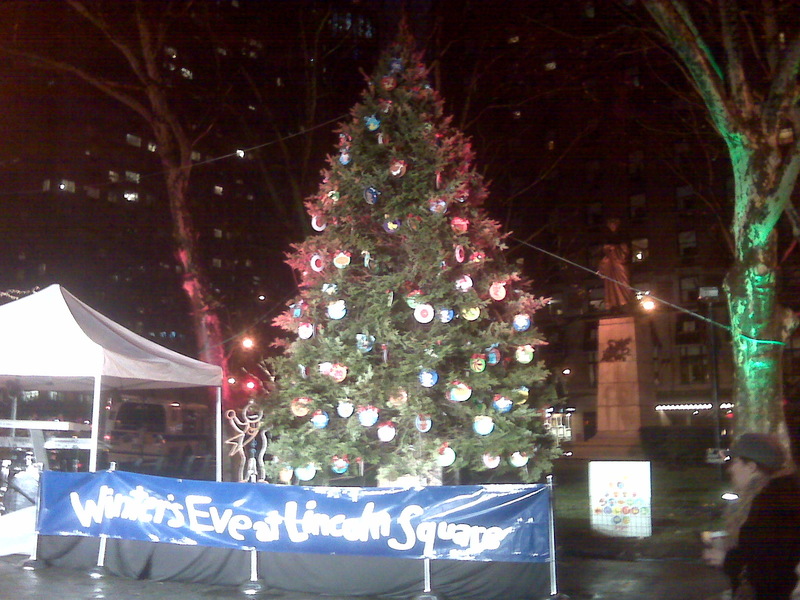 Two hours ago I returned from Winters Eve at Lincoln Square. I decided to attend the event after City Harvest was seeking volunteers, and while I had to survey a good 12 event goers, it was all worth it at the end! Joy Behar, the comedian on the View was going to do the tree ceremony, however I never managed to stay by the tree long enough because all the restaurant booths had my mouth watering and my senses curious. Many restaurants participated, Bar Boulud, Josephina, Pincholine, 'wichcraft, Asiate, Bouchon Bakery all offering delicious delectables ranging from $2-$4, of which some of the proceeds would be donated to City Harvest. The foods varied from ciders, small bites and desserts. Michelle-a friend and fellow chef--and I sampled Crab Cakes with Corn Polenta from Josephina, Mini Cheeseburgers from PJ Clarke's; and Pumpkin Soup with Candied Pumpkin Seeds from Cafe Boulud. We then rolled our way to 60th Street and indulged in pastries from Bouchon Bakery and warm doughnuts with an Apple Cider Reduction from Asiate. Although the food seems to be the spotlight of my evening, for those of you who are not foodies (and why not!) there was live music, ice sculptures, and other great entertainment! The evening was truly a blast! My tummy is beyond stuffed, plan on drinking green tea to help ease it all. But at the very same time a very greedy part of me can't wait until next year so I can do it all over again! If you enjoy baking cakes, muffins, scones or cookies you have seen recipes asking for baking powder, baking soda or both. But even for non-bakers, recipes like buttermilk pancakes and waffles may also ask for a pinch of one or the other. But what's the difference? Can we use baking powder/baking soda interchangeably? The answers and much more cool facts can be found in the Dec 2009/Jan 2010 issue of Fine Cooking. The article: Baking Soda and Baking Powder by Brian Geiger. 1. Baking Soda needs an acid to activate/create bubbles. Thus, recipes asking solely for baking soda would have either "lemon juice, buttermilk, yogurt, or vinegar" added. 2. Baking Powder has baking soda and "enough acid to cause a balanced reaction" Therefore, it only needs a liquid--whatever liquid, milk, water etc--to activate. 3. Baking Powder Labels: "Fast-acting reacts at room temp." Slow-acting needs a higher temp. Double-acting reacts a bit at room temp and finishes reacting in the oven. "If you find a baking powder that doesn't specify a type you can assume it's the double-acting type." 4. Baking Powder and Baking Soda affect browning as well as rising & achieving lift. 2 parts cream of tartar + 1 part baking soda + 1 part cornstarch. Keep in an airtight jar in the kitchen pantry or somewhere dry and cool for a few months. This article came at just the right time. A close friend of mine--who somehow thinks I know all the cooking answers--asked me "What's the difference?" Fortunately I was able to answer the question in great detail, and keep my reputation going! OK, okay, I couldn't accept the credit, I actually confessed. Prior to this article I wouldn't have been able to explain. Proves that you learn something new every day, if you don't you weren't looking. This was mine! Truck or Treat Update! Calculations are In!!! Thank you for helping raise money for City Harvest via Truck or Treat!!! I made the deposit to City Harvest yesterday--Grand Total $100.28!!! Next year will aim to beat this amount, but every little helps so I am extremely grateful for the great turnout! Thank you for making that possible! BTW, For those of you at Park Lane thank you for indulging in the Halloween cupcakes and for helping support A Pinch of Salt. Love the feedback and of course the empty platter spoke for itself!!! And thanks for contributing to the Truck or Treat box! Glad to have been a part of such a successful event!